Residual stresses have strong influence on in-service behaviour of structural components. Depending on their nature, magnitude and distribution they can contribute for increasing the expected life of a component or for its premature failure. Generally, the manufacturing processes of structural components introduce residual stresses in the component. The use of non-destructive methods for detection and measurements of residual stresses have been increasing in the last years, because they do not promote changes in the material under examination and do not interfere in its later use. The non-destructive test method based on Barkhausen emissions from ferromagnetic materials is sensible to changes in microstructural characteristics and the stress state of the material and can be used to evaluate these materials characteristics. This paper presents a study on the use of Barkhausen Noise Analysis in detection and measurement of residual stresses in ferromagnetic materials. The results are compared with the ones obtained from the Hole-Drilling Strain-Gage Method. Barkhausen effect results from discontinuous changes on magnetisation due to interactions occurring between domain walls and pinning sites present into a ferromagnetic material during magnetisation process . In the demagnetised state, magnetic domains are randomly oriented into material and the resulting magnetisation is zero or near zero. Under influence of a variable magnetic field, the domain structure changes, in order to achieve a new equilibrium state due to the presence of the external magnetic field. Magnetic domains oriented in directions close to the magnetic field direction increases, the opposite occurring with those oriented into another directions. The increasing of magnetisation takes place by means of two mechanisms. Domain walls motion at low values of the applied magnetic field and domain rotation, at high field values . Domain walls motion is affected by the presence of structural discontinuities and mechanical stresses, which actuate as pinning sites to their movement, that occur in jumps, from one pinning site to the another [3,4]. For materials with positive magnetostriction Barkhausen noise increases under influence of tension stresses and diminishes for compression stresses . This behaviour permits to perform measurements of the stress level in ferromagnetic materials after a specific calibration. In this paper, calibration curves for magnetic Barkhausen noise (MBN) measurements were obtained from uniaxial loading condition and used for residual stresses evaluation of ASTM A 515 steel samples. The results obtained where compared with residual stresses measurements performed using the Hole-Drilling Strain-Gage Method according ASTM Standard E 837. MBN measurements were carried out using a microprocessor-controlled Stresstest 20.04 unit and the 144221 general use probe. The Stresstest 20.04 controls the test parameters and data acquisition process during the measurements. The probe incorporates a yoke, to exciting the material with a variable magnetic field and a pick-up coil to detect the corresponding magnetic Barkhausen noise. The material can be excited using a variable magnetic field with frequencies of 10 Hz or 100 Hz and the magnetic Barkhausen noise resulting can be detected from depths of 0.05, 0.10, 0.20, 0.40 e 0.80 mm. Measurements of stress during the test system calibration were performed with a PL-10-11 strain gage (TML) and residual stress measurements were performed with a FRS-2-11 rosette (TML) respectively. The instrumentation for strain measurements includes a 4 1/2digit microvoltimeter and a power source with a 10-channel selector. Measurements were performed at room temperature. The material used in this study was ASTM A-515 Grade 55 steel, due to its importance as a structural material for medium and high temperature applications in siderurgical, chemical and petrochemical plants. Tension tests performed in samples of this material according ASTM E 8-96 shown a yield strength of 310 MPa. The calibration test specimens, residual stresses simulation test specimen and welded test specimen were obtained from a 1000mm x 1000 mm x 6,35 mm plate of the material studied. The material surface at the places selected to fix the strain-gages and the rosettes were prepared according to the conventional techniques of strain gage technology. 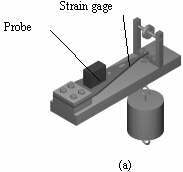 Fig 1: Constant stress beam used in the experiments. 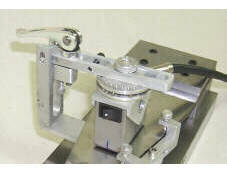 Calibration was performed using a constant-stress cantilever beam as a calibration test specimen, as shown in Figure 1. Two beams were machined from a plate of the tested material, with the axis coincident with the directions parallel and perpendicular to the rolling direction of the material, identified as constant stress beams A and B respectively. After machining, the beams were submitted to a heat treatment for stress relieving. The beams were instrumented with two strain-gages each, oriented parallel to the beams axis and arranged in two different places at the beams surface, in order to check the condition of "constant stress" along to the beams axis. During the load test, the difference between the stresses determined by the two strain gauges remains about 0,5%. The experimental set-up used to the test system calibration is shown in Figure 2. Fig 2: Experimental set-up used to test system calibration. Generation of tension (a) and compression (b) stresses in the upper surface of the constant stress beam.gure Fig 3: Probe holder for Barkhausen probe positioning. The probe was positioned parallel to the beams axis to maintain the direction of the magnetic excitation field parallel to the beams axis. A special probe holder was developed to conserve the probe in the same position and with the same pressure against the material surface during the calibration step, as shown in Figure 3. The loads were applied at the extremity of the beams, in an incremental way, using a dead load system, generating tension and compression stresses at the beams surface. To each applied load, the corresponding strains and Barkhausen noise rms value were registered and a curve relating stress level with Barkhausen noise rms value was plotted. Figure 4 shows the calibration curves obtained for the two beams, corresponding to the MBN measurements performed in the directions parallel and perpendicular to the rolling direction of the material . Fig 4: Calibration curves for the constant stress beams A (a) and B (b), corresponding to the measurements performed in the directions parallel and perpendicular to the rolling direction of the tested material. In the first experiment, a known load was applied at the extremity of the constant-stress beam B, in order to simulate the presence of residual stresses. After this, the beam surface was scanned using the Barkhausen probe. In a specific place of the beam surface, the magnetic Barkhausen noise presented values above those expected due to applied load. At this point, a residual stress rosette was installed and measurements of residual stresses performed using the Hole-Drilling Strain-Gage Method, at the depths of 0,2 mm, 0,4 mm and 0,8 mm. The obtained results are shown in Figure 5. Fig 5: Results of residual stresses determination using the central hole drilling method and magnetic Barkhausen noise measurements at depths of 0,2mm, 0,4 mm and 0,8 mm. Fig 6: Welded specimen used in the residual stress measurements. In the second experiment, measurements of residual stresses were performed in a welded specimen, where the weld seam is perpendicular to the rolling direction of the material, as shown in Figure 6. In a specific place of the specimen, measurements of MBN rms value were performed in the directions perpendicular and parallel to the weld seam. 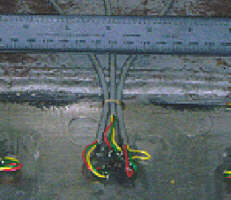 After this, a rosette for residual stresses determination was installed at this place, with the elements 1 and 3 positioned in the directions parallel and perpendicular to the weld seam respectively. Residual stresses measurements were performed according ASTM E 837-95 standard. The results obtained for the depths of 0,2 mm, o,4 mm and 0,8 mm are shown in Figure 7. Fig 7: Residual stress measurements obtained for the Hole-Drilling Strain-Gage Method (HDSGM) and MBN measurements. The calibration curves obtained for the constant stress beams A and B shown in Figure 4 (a) and 4 (b), presented two distinct regions, with different behaviour. For low values of the tension and compression stresses, the relation between the rms MBN value and stress magnitude is approximately linear. After a certain level, the changes induced in the MBN value due to stress increasing, diminish until a point where saturation occurs. For the material tested and the experimental set-up used, these points are 50% of the yield strength for tension stresses and 30% of the yield strength for compression stresses. The rms values of MBN obtained for the constant stress beam A are higher than the ones for the constant stress beam B. This behaviour was expected because the axis of the beam A, coincident with the measurement direction, is parallel to the material rolling direction. 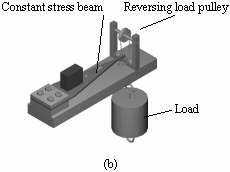 The values of residual stresses at the constant stress beam B, determined by the Hole- Drilling strain-gage method and MBN analysis were higher than the expected due to the loads applied to the beam to simulate the presence of residual stresses. Although different in magnitude, the two methods presented the same tendency as the depth increases. For the welded sample, the principal residual stresses determined by the Hole-Drilling strain-gage method occurred in the directions of the elements 1 and 3 of the residual stress rosette. The measurements of MBN in these directions indicated that this test method was sensitive to the changes in the material stress state but have limitations for high values of compression stresses. In all situations, the values determined by MBN measurements presented values smaller than those obtained by the Hole-Drilling Strain-Gage Method. The MBN measurements were sensible to the stress changes occurred in the tested material. However, the results obtained for residual stresses measurements by this test method indicate stress levels smaller than the values obtained by the Hole-Drilling Strain-Gage Method. To obtain more conclusive results about the possibilities and restrictions to the use of this test method as a tool for quantitative residual stresses determination in structural materials it is necessary to perform more detailed experiments, with specimens submitted to a different residual stresses levels and calibration conditions. Dhar, A., Jagadish C., Atherton, D. L., "Using the Barkhausen Effect to determine the Easy Axis of Magnetization in Steels", Materials Evaluation, October 1992, pp1139-1141. CULLITY, B.D. Introduction to Magnetic Materials, Londres: Addison-Wesley Publishing Company, 1972. 666p. SIPAHI, L. B. Overview of Applications of Micromagnetic Barkhausen Emissions as Noninvasive Material Characterization Technique. Journal of Applied Physics, v.75, n.10, p.6978-6980, Maio 1994. KAMEDA, J., RANJAN, R. Nondestructive Evaluation of Steels Using Acoustic and Magnetic Barkhausen Signals - I. Effect of Carbide Precipitation and Hardness. Acta Metallurgica, v.35, n.7, p.1515-1526, 1987. PASLEY, R. L. Barkhausen Effect - An Indication of Stress. Materials Evaluation, p.157-161, Julho 1970. AMERICAN SOCIETY FOR TESTING AND MATERIALS, ASTM E 837 - 95; Standard Test Method for Determining Residual Stresses by the Hole-Drilling Strain-Gage Method. 1996. 7p. Silva Jr., S. F.,Determining Residual Stresses in Ferromagnetic Materials by Barkhausen Effect, MSc Dissertation, UFMG, Belo Horizonte, Brazil, 1998.